Grilled pizza? Yes you heard me right. I am sure it is not an foreign idea to many of you, but in my house it was. You should have seen Kevin’s face when I said I wanted to grill a pizza. I have to admit, I was a bit nervous, especially with his reaction to the idea. But I do love a challenge so away I went! This recipe is taken from a recipe posted by a friend of mine, Ann from Sumptuous Spoonfuls. She posted her grilled pizza recipe and I immediately pinned it and knew I wanted to give it a try, I just had to wait for the right time. I mean who wants to grill in the rain? So I was patient and when we finally had a few days of lovely weather I ran to the store and purchased all of the goodies needed for my grilling adventure. I was even planning on making homemade pizza dough! For those that know me, my last try at baking something with yeast was an epic fail! So I figured, what the heck, I am already nervous let’s go for broke!! I will admit, this does take a bit of time to put the whole meal together, but with 5 tasters all giving me 2 thumbs up on the final product, I think it is well worth it!! My only regret? I didn’t make two!! I only ended up with one little piece for myself. I will post the recipe to make two pizzas. Mix all of the ingredient in a shallow dish and add the chicken. Cover and marinate in the refrigerator for at least 2 hours. Overnight would be better if possible. After the dough has risen, punch it down and place it back on the floured surface. Using a roll pin or your hands, form it into your desired shape. Place the towel back over the dough and let sit in the warm place for 10 minutes. While the dough is rising again, melt 3 tablespoons of butter. Mix it with the last teaspoon of garlic powder and 1 tablespoon of Parmesan cheese. Bring the dough back out and using a spoon or pastry brush, apply the butter and garlic mixture to the outside edges of the crust. In a small sauce pan whisk the ingredients over medium heat simmering for 5 minutes making sure to stir often to avoid the sauce sticking to the pan. Heat the grill to medium high heat. Grill the chicken breasts until done, let cool for a bit and then shred the breasts. 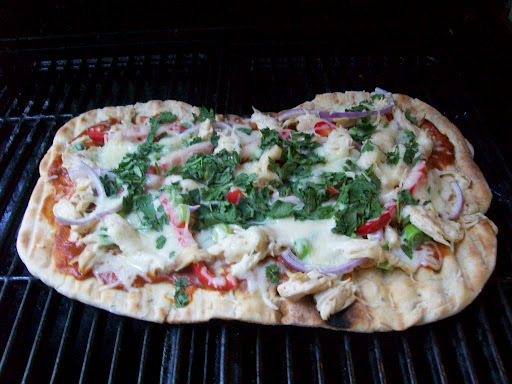 Turn one side of the grill off so you can turn the pizza dough over onto indirect heat to heat the toppings. Oil the grates of the grill and place the pizza dough on the grill. Cover and grill checking occasionally until the dough begins to bubble and the bottom is brown and crusty. Turn the crust over and place on the cool side of the grill. Brush the crust with the spicy peanut sauce (I used quite a bit), top with half of the chicken, and half of all of the veggies, reserving the cilantro until the pizza comes off the grill. Cover and grill until topping are warm and the cheese has melted. Check the crust occasionally but be patient this took a little while. Remove pizza from grill and top with half of the chopped cilantro. Drizzle with more Sriracha sauce if desired.